Matterhorn is ranked as one of the most beautiful mountains in the world together with Fitz Roy, Alpamayo, K2, Ama Dablam, and Machapuchare. 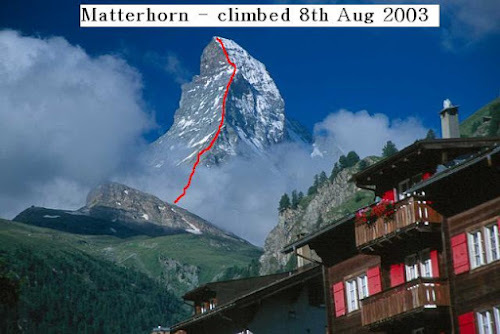 The combination of the sensational events surrounding the Matterhorn's first ascent (Edward Whymper 1865, when 4 people died) and its singular appearance from all quarters, but particularly from Zermatt, has ensured a worldwide fame that has lasted to this day. Nevertheless it is estimated that a total of five hundred people have come to grief on the peak, the great majority on the normal routes. One should never underestimate the difficulties and the length of the the climb. It is important to GET OFF the mountain before noon, because late parties often get into trouble after rapid change in weather and thunderstorms. See the photos and descriptions for more about my climb.